I was talking with a friend this weekend about how we were pretty much the perfect age when Transformers came out. I can still remember the first time I saw them on the store shelves. I also remember watching the cartoon when it premiered. Even at a pretty young age I was aware that not all of the toys looked like their cartoon counterparts. The biggest two examples were Iron Hide and Ratchet. Iron Hide and Ratchet were pretty much one toy with two different paint schemes and minor kibble to make them different. Ratchet was the medic and Iron Hide was the blue collar soldier that was always at Prime’s right hand. They were big, burly looking bots that were always on the cartoon. Their toys were…well they were special. Their heads were stickers. The tops of the vans turned into the sled type vehicle. They were not what the cartoon was showing us. Over the years there have been a number of new versions of Iron Hide and Ratchet, but I think iGear is about to release my favorite ones. 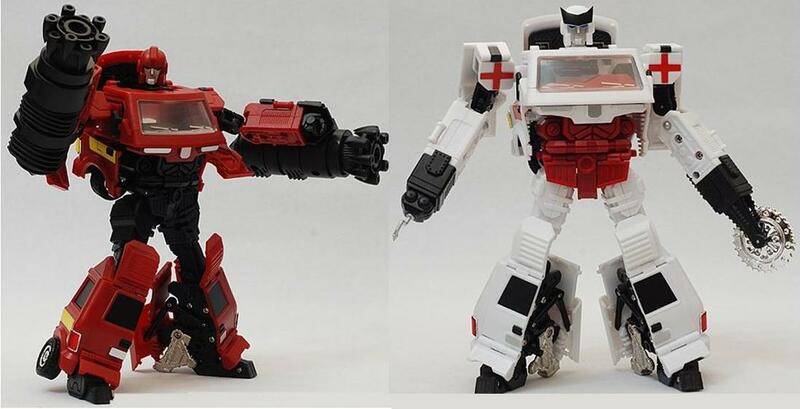 Now iGear is a third party manufacturer, so they are actually releasing PP05M Medic and PP05M Weapon Specialist. Third party Transformers are never cheap; these will cost almost 120 dollars a pieces. Each of the bots does come with a huge amount of extra tools and weapons. I love that there is a market out there to provide fans with versions of characters that they want. I’ve had Fansproject’s version of Springer since he was released and I couldn’t be happier with the purchase. I was never a huge fan of Iron Hide or Ratchet, but if I was I’d be scraping up the cash for a pre-order.